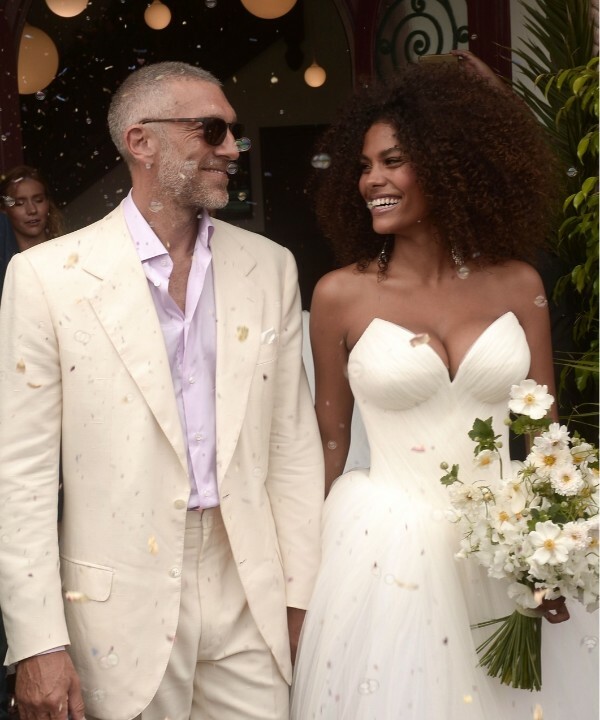 Star of "My King" and "Black Swan", 51-year-old actor Vincent Cassel married the French model Tina Kunakey. The bride recently turned 21 years old. A modest ceremony attended by only the closest ones took place on Friday, at the mayor's office of Bidar near Biarritz (south-west of France). The newlyweds looked very happy, and the groom did not take his admiring eyes off the bride. However, like all the guests. The bride was wearing a light ivory dress from Vera Wang with a strapless corset and a deep neckline and a tulip skirt. The groom had a cream suit, a pink shirt and dark sunglasses. After the wedding ceremony, the actor posted on his personal page a photo with the bride and the caption "Yes! . The bride in turn in social networks thanked the stylists Marc Jacobs Beauty, who helped her with the wedding make-up and hairdo on such an important day for her. Tina had a light natural makeup and simple hairdo, which was almost the same as everyday - careless curls. The bouquet was chosen by the bride in the style of Rustik - as if assembled five minutes before the exit from the field flowers. Although in fact such a bouquet is carefully thought by the florist. On the morning after the celebration, Vincent arranged a surprise for his young wife - she sang a serenade in Portuguese under her balcony. 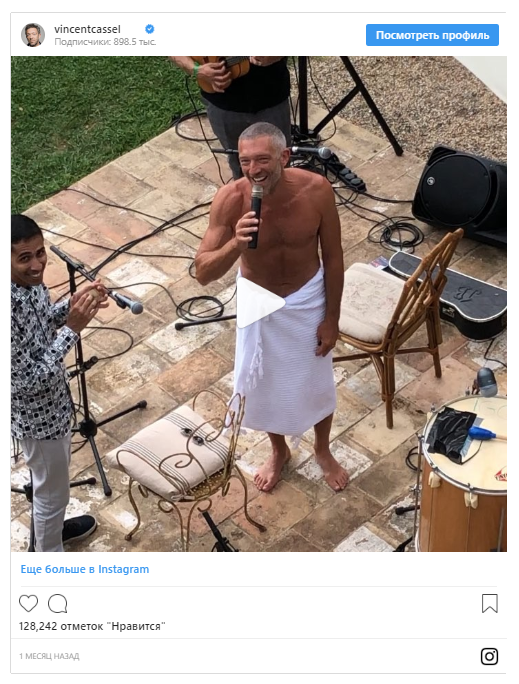 True, the actor was right after the pool, and in one towel. But it seems that Tina did not feel embarrassed at all. Recall that Cassel was already married. He lived in marriage with the Italian actress Monica Bellucci from 1999 to divorce in 2013. The couple have two daughters, Deva, 13 years old, and Leoni, 8 years old. The actor met Tina in 2015. Along with his young friend, the actor himself became younger: he started windsurfing, learned Portuguese. 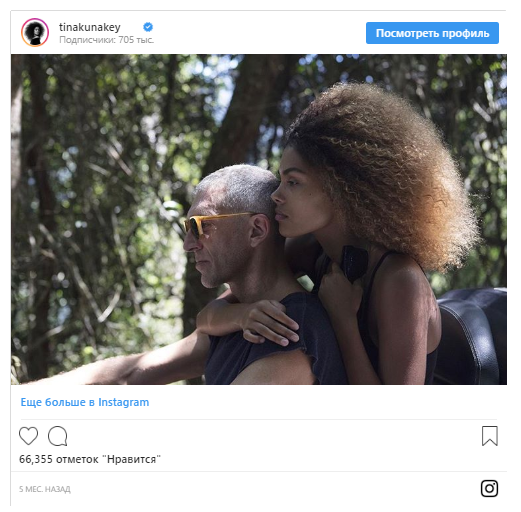 Recently, Cassel and Kunakey in an interview for the magazine Vanity Fair Italy admitted that he never thought he would marry again. "I reasoned like this: I was already married, I have two daughters, I did what I had to do; I will now remain a bachelor forever, "the actor said. "It was fun, but after a while I realized that my life is empty. I did not expect to meet with someone, but it happened. And this woman is much younger than I could imagine. " In addition, the actor expressed a desire to become a father again: "Children are the most wonderful thing that exists. Through the children I learned a lot, including myself.
" In another interview for The New York Times in early August, Cassel said that love "is not always fair." "I'm 52, and I'm taking a 21-year-old girl to be my wife. I'm very much in love and I'm sure we will have children. "